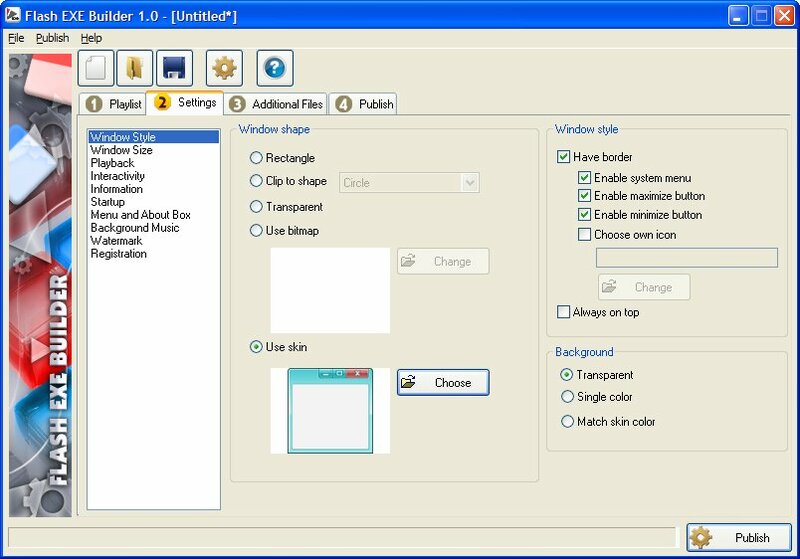 Flash EXE Builder creates professional Windows application from .SWF files created using any Flash authoring tools. Create professional Windows desktop application using Flash. Add skin, splash screen, customizable context menu and ability to create full application installer. Add customizable image and text watermark, background music, etc. Use Windows API via extensible Flash FSCommand. Publish as EXE file, screensaver, autorun CD/DVD. ...... for easy distribution. Add customizable image and text watermark, background music, local online help, and many more. Use Windows API in your Flash application such as registry, local file access, system information via extensible FSCommand. Specify serial number, expiration limit for selling your Flash application online. Publish as executable file (EXE), screensaver, or autorun CD/DVD. It has been tested and works on Vista. * Package the published output with full application installer for easy deployment. * Add serial number protection and expiry date to the published Flash application. * Ability to include multiple files (SWF, BMP, JPG, PNG and MP3 files). * Add customizable image and text watermark. * Publish as executable file, screensaver, or autorun CD/DVD. * Choose from various ready to use window shapes and skins. * Flash EXE Builder support variety of FSCommands. You can also extend the FSCommand capability via plug-in. Qweas is providing links to Flash EXE Builder 1.30 as a courtesy, and makes no representations regarding Flash EXE Builder or any other applications or any information related thereto. Any questions, complaints or claims regarding this application Flash EXE Builder 1.30 must be directed to the appropriate software vendor. You may click the publisher link of Flash EXE Builder on the top of this page to get more details about the vendor.